A super short article today...mostly a couple of photos. 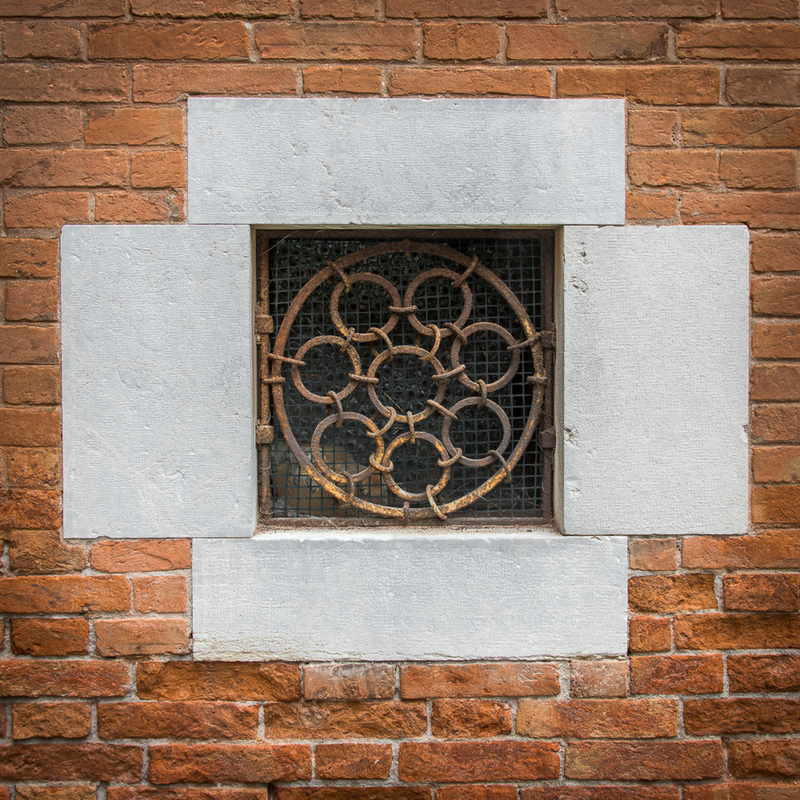 While wandering Venice, I happened upon an apartment building with some interesting windows. After passing by several of the windows, I began to notice that they were each crafted in a different way. Though all were barred with iron, each had a pattern that was unique. Here is the building to which I refer with its Corte de L'Albero. You may recognize the pozzo in the courtyard, as it was one in my recent article called Venetian Pozzi, and it was a featured transformation in Transforming the Pozzi. The windows on the far side of the building were a bit different than the ones seen above, in that one set was craftily 'framed' in carved stone with dentils and one was just framed with large stone blocks. These two photos give you a better idea of what I describe. Here I've put 15 of these unique windows together in a collage. You can click on the image to get a larger view. 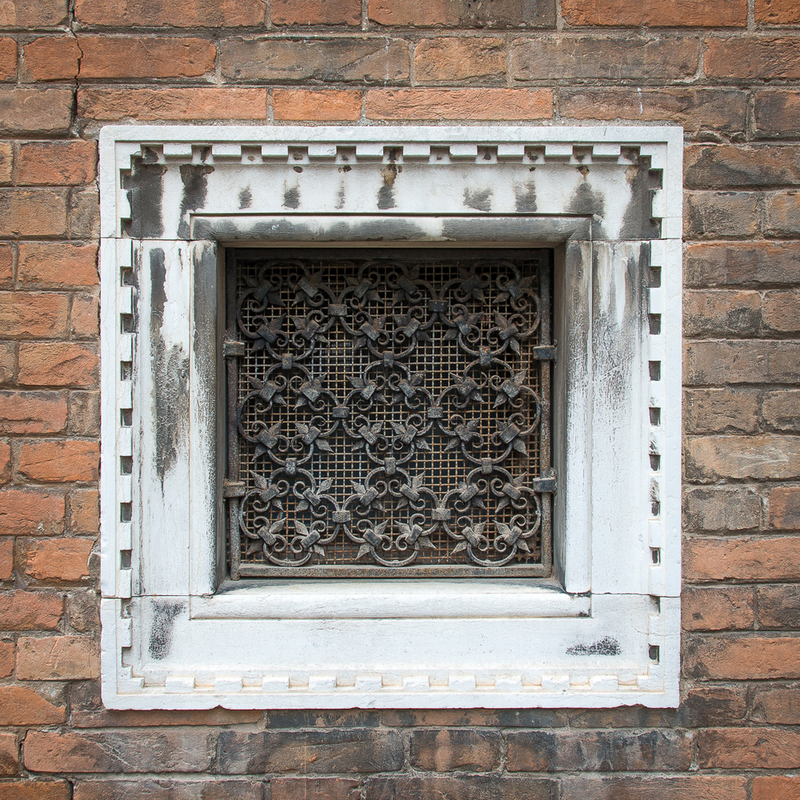 I never cease to be amazed by the craftsmanship that can be found throughout Venice in all sorts of elements. One last thing about Corte de L'Albero: playing off of a recent article regarding the pozzi of Venice and the Venetian water supply, here is one of the more modern water fountains that can be found throughout Venice. Though this gentleman is just washing up, the locals are not shy about drinking from these fountains, as the water is rumored to be fresh from the Italian alps. Many of the motif are lion heads with water issuing forth from their mouth, like this one. That's it for today. I told you it would be a short one. 1) Click on 'Comment' just below in this article (the look depends on whether you are using a computer, iPad, iPhone or similar). 3) You will probably see a dialogue box something like this one. 4) The default selection is Email Address and Password with the interlocking Ss, as circled in the image, above. This is where the confusion has come into play for the past few months. 5) Click on the human silhouette as shown here. 6) Now, all you have to do is enter your name (or anyone's name for that matter) and ignore the Email and Website URL options, as they are optional...and then click on Login or Submit button (again, depends on what sort of device you are using). 7) Please accept my apologies for this laborious process. Squarespace assures me they are working to make this easier and more intuitive.